A single -5° reading has been recorded by the LogTag monitoring a vaccine fridge. If this is a valid reading then the vaccines are potentially compromised and need to be destroyed. Looking at the results around the single -5°C reading, there is a distinct cycle between about 4 and 6°C which is very consistent in size and period (15 to 20 minutes). Is it physically possible to cause the spike? It is not physically possible for a fridge to drop 9°C in 5 minutes without an extreme event occurring. The thermal latency of the LogTag also means that the device won’t respond instantly to changes. Assuming that the sudden step down was legitimate, it is almost impossible for the fridge to then jump back up 9° to where it was previously. We can see on the graph that the compressor is turning off at 4°C and it is taking 10 minutes for it to naturally rise up to 6° before the compressor turns on again. On this basis, for the fridge to naturally heat up from -5° back to 6° it would take over 45 minutes, not 5. What happens if you ignore the spike? If this single reading was to be ignored, the shape of the graph is totally consistent. Therefore, taking everything into account, the only logical course of action is to ignore the outlier. 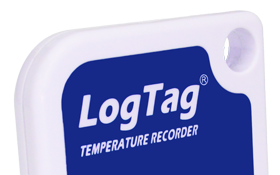 The LogTag uses an external probe to measure temperature. If the probe is disconnected it will read -40°C. If, however, the connection is compromised then it is possible to get a misreading. This is very unusual but is possible. A momentary bump on the cable/connector or possibly a severe EMF noise spike may have caused it. Since it is a one-off, it is not possible to determine the cause. If it happening consistently, the the LogTag may be faulty, or a low battery may be causing strange results. On the basis of the data around the reading, the reading is obviously false and can be classified as a misread. There has been no compromise to the quality of the fridge’s contents. If this is a one-off event, ignore it completely. If it happens a number of times, replace the LogTag.